When the person who treads the path of jnAna, at the apex of his SAdhanA, resorts to bhakti for the extinction of his ego, the mind and intellect come into the semi-physical heart, the seat of the ego; the heart is filled up by love in its subtle form and the ego thins out and then goes and shrinks into the central gate -- all this process takes place (involuntarily) without his knowledge! The Atman is attributeless, so the mind has no hold on it or has only a vague hold. So as the Guru has told him he holds on to what appears as the root or source of breath and thought and he concentrates at that ‘point’. That is all. The Guru might have told him and he would have learnt that it is the center of the heart. 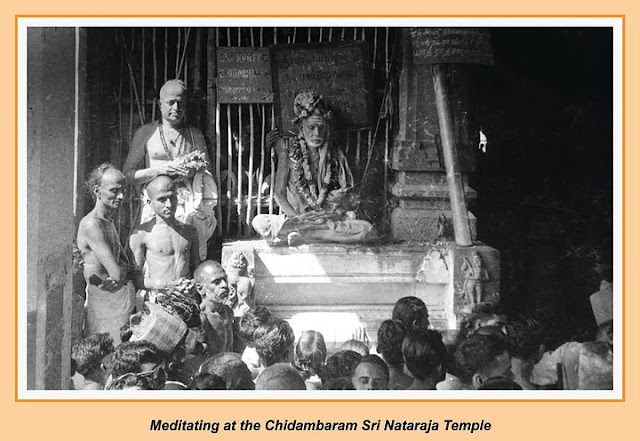 Still in actuality, his cittam (antaHkaraNaM) will not be drawn into it permanently in its entirety then and there. To a certain extent he has located something like that and his cittam stations itself there for the moment. All the vAsanAs have to be exhausted, ego has to be totally extinguished; only thereafter, it stands there for good. Here ‘stands’ has two connotations: one is, ‘stops, halts’; the other is ‘endures, abides, belongs’. So here what happens is, the process begins with the first meaning and ends with the second.